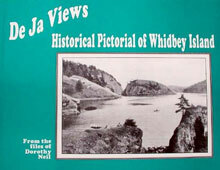 Over a century and a half ago, two peoples met on Whidbey Island and discovered each other. Master Joseph Whidbey, first mate of Captain George Vancouver, English explorer and navigator who anchored in the Straits of Juan de Fuca sent his survey crews out in small boats. Native American tribes who lived on Whidbey Island welcomed the white men, traded with them, lived among them, and sadly, eventually disappeared from Whidbey. Both groups left behind a rich history, fascinating to those fortunate enough to live on the island and indeed to anyone interested in local history.